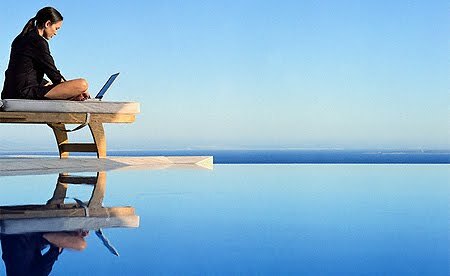 In April and May Sony had to deal with hackers breaching security on their Playstation Network. They took the service down for a little more than three weeks. During these three weeks resale prices for online enabled PS3 games decreased in price more than their Xbox 360 counterparts. 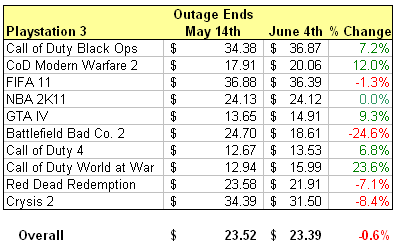 The PSN outage ended May 14th and PS3 games have online capabilities again - but have PS3 prices recovered? We used the same ten games from the first article and compared the resale prices from May 14th (day network came back) to June 4th (three weeks later). During this time Playstation 3 prices decreased 0.6% while Xbox 360 prices decreased 5.4%. PS3 prices didn't recover to their pre-outage levels, but they did hold steady and perform much better than the 360 resale prices. When the network came back PS3 owners started buying more games again, but not enough to cause an overall increase in prices. Before the outage started the average Playstation 3 game was selling for more than the average Xbox 360 game. But near the end of the outage 360 gamers started paying more for the 360 versions. 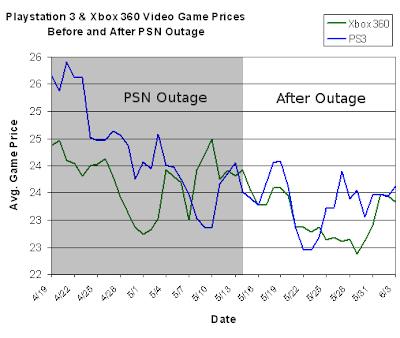 Three weeks after the network went live again PS3 prices had again become slightly more expensive than the 360 games. 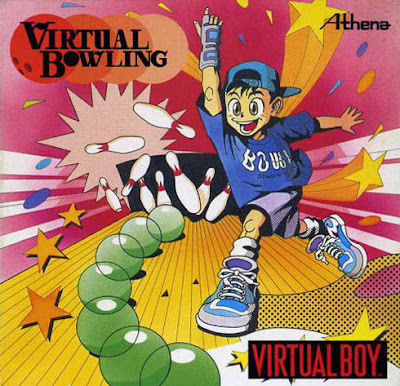 Virtual Bowling for the Virtual Boy is about to join the elite group of rare video games to sell for more than $1,000. The auction for a complete version of the game is selling for $940 with five days to go. 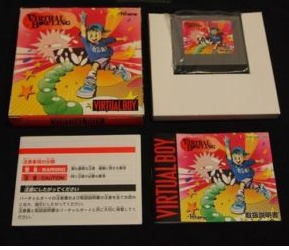 The game was only released in Japan and is the hardest to find of the Virtual Boy titles. The last time we saw the game actually sell was April of 2010. It sold for $750. Today is the first day of E3 2011 and Microsoft will be leading off the conference with their press conference at 12:30 EST. The shows are usually pretty interesting with lots of new game announcements, a couple huge surprises, and some interesting theatrics too. 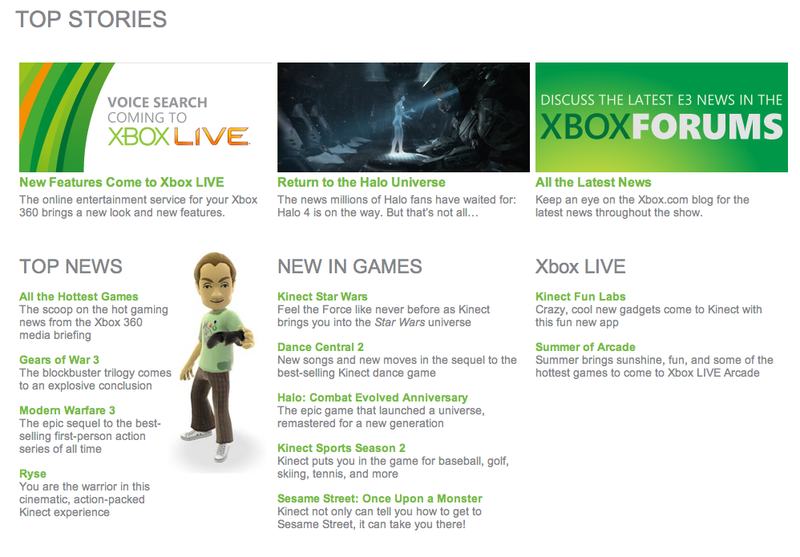 Some news from Xbox 360 has already leaked. Kinect Star Wars. Dance Central 2. 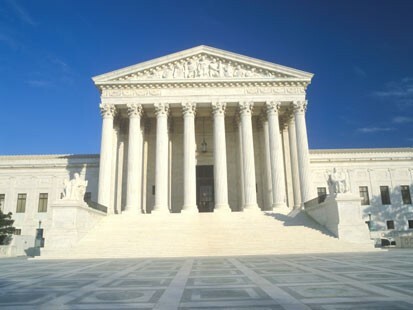 Halo 4 is on the way. Let us know what you think of the conference after you watch it? What game are you excited for? Dragon Quest V has fallen a long way. In March we wrote about Dragon Quest V being a really expensive Nintendo DS game selling for $55-60 used. In late April it was reprinted and available at most stores for $39.99. Now Amazon has it for sale for $19.99 brand new. In three months DQV went from $60 to $20. A great example of the risks in buying rare video games for collecting, one reprint and the price drops 66%.